Are Viruses the New Frontier for Astrobiology? 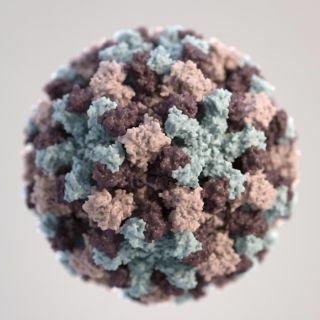 A three-dimensional representation of a norovirus virion, based on electron microscopic imagery. Should astrobiologists also be considering virions and viruses when looking for life beyond Earth? They are the most abundant form of life on Earth, but viruses — or their seed-like dormant state, known as virions — are outliers in our search for life on other planets. Now, one group of scientists is pushing for astrobiologists to consider searching for viruses beyond Earth more seriously. Viruses are mentioned six times in NASA's 250-page-long current astrobiology strategy, write the authors of a recent paper called "Astrovirology: Viruses at Large in the Universe." They call for the study of viruses to be incorporated into extraterrestrial science missions and astrobiological research at home, and have a checklist for the actions needed to put viruses on the interplanetary map. It has been more than a century since scientists discovered the first virus, and for decades it was known simply as a "very small disease-causing agent." Late Nobel laureate Sir Peter Medawar even referred to viruses as "a piece of bad news wrapped up in a protein," Stedman and colleagues wrote in the study, which was published in February in the journal Astrobiology. Future missions to sample the plumes of Enceladus (seen here pictured in silhouette against Saturn’s rings by NASA's Cassini spacecraft) or Jupiter's moon Europa should carry with them experiments to detect virions and viruses, some scientists say. Virions, on the other hand, are the viral seeds that could become viruses if they happen upon compatible living cells in which to replicate. On Earth, virions and viruses go hand-in-hand with life, and if we find the former on other planets, they could point to cellular life once having existed on them. On Earth, viruses are thought to outnumber cellular life forms by a factor of 10. And our planet is teeming with virions. In fact, a teaspoon of sea water can contain up to 50 million virions. However, there are currently no extraterrestrial missions planning to hunt for virions in the suspected water plumes on Jupiter’s moon Europa or the jets of the Saturn satellite Enceladus. Ken Stedman (right) working in his lab. Stedman is a virologist and Chair of the NASA Astrobiology Institute’s Virus Focus Group. "Astrovirology is no more, nor less, valid than astrobiology," said Don Cowan, director of the Centre for Microbial Ecology and Genomics at the University of Pretoria in South Africa. "There is no reason why astrovirology should not be considered with the same emphasis as 'prokaryote' [i.e. bacterial] astrobiology, particularly since the lesson from Earth's biology is that every known organism has one or [sometimes many] more virus parasites," added Cowan, who was not involved in the new study. Part of the reason for astrovirology’s absence from space-science agendas, Stedman said, is that virologists have not been reaching out to astrobiologists and pushing the case for virion hunting. Another major reason is technical: virions are tiny (with diameters ranging from 20 nanometers to over one micrometer), and so scientists need transmission electron microscopes to see their unique and varied shapes. "While this may not be difficult on Earth, it seems unlikely that a transmission electron microscope will be put on a spacecraft in the foreseeable future," the authors noted in the study. That was one of the authors’ aims in writing their paper — to stimulate the development and testing of technologies that scientists could use in remote locations to discover virions. "We need to look for biosignatures, and the morphologies of these virions are extremely distinctive," said Stedman. However, another challenge is finding a way to look for unknown virions. "We have to be careful when trying to find genomes of things that we don’t know are there," Stedman said. While there are techniques to identify known viruses, such as high-throughput sequencing or high-density microarrays, identifying truly novel virions could pose a problem, the authors wrote. Scientists can hunt for extraterrestrial cellular life forms, such as bacteria or more complex life, by looking for certain chemicals on a planet or in its atmosphere, but virions do not create byproducts like methane or oxygen. But, the authors hypothesize, if viruses had once infected life on other planets, perhaps those viruses changed the host organism’s metabolism, and this could be remotely detected from Earth. One possibility is that host organisms’ chemical byproducts may be slightly different than those that had not been infected by viruses. If this were the case, this could be a proxy for detecting cellular life and viruses. In the short term, the astrovirologists suggested that, among other things, researchers need to find distinctive virus biosignatures; consider virus-detection experiments for Europa and Enceladus; and include virus models in our models for ancient oceans and other planets. However, Stedman said that finding no virions on a life-hosting planet would also be an important discovery. "If we find somewhere else where living cells don’t have viruses associated with them, [then] that would be something very different from Earth, and very interesting." The work was supported in part by the NASA Astrobiology Institute (NAI) element of the NASA Astrobiology Program. This story was provided by& Astrobiology Magazine, a web-based publication sponsored by the NASA astrobiology program. This version of the story published on Space.com.